"East Asia-Arctic Relations: Boundary, Security and International Politics" is co-edited by Kimie Hara and Ken Coates. The new book’s 12 chapters are written by Arctic and Asia relations experts from Canada, China, Japan, Korea, Russia and the United States. Recent world troubles, including climate change, the Fukushima Daiichi nuclear disaster and oil price volatility from the Arab Spring, are motivating East Asian states to become more deeply engaged in Arctic affairs, according to the editors of a new book released today by the Centre for International Governance Innovation. The volume is the outcome of an international collaborative project, which aimed to launch a focused and detailed conversation about the historical, contemporary and future dimensions of East Asia countries’ relationships and interests in the Arctic. The focus of the initiative was to identify potential points of conflict and cooperation in this significant global governance issue. 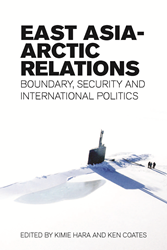 "East Asia-Arctic Relations: Boundary, Security and International Politics" is available for purchase ($25 paperback; $12.50 eBook) at http://www.cigionline.org/asia-arctic. Review copies for those considering using the book as course material are available by contacting orders@cigionline.org. Kimie Hara is professor and the Renison Research Professor at the University of Waterloo, where she is also director of East Asian Studies at Renison University College. She specializes in contemporary international relations of the Asia-Pacific region, border studies, Cold War history, and Japanese politics and diplomacy. She has held visiting fellowships/professorships at Kyoto University, the University of Tokyo, the International Institute for Asian Studies/University of Amsterdam, the East-West Center, Stockholm University and the Institute of Oriental Studies of the Russian Academy of Science. Ken Coates is Canada Research Chair in Regional Innovation at the Johnson-Shoyama Graduate School of Public Policy. Raised in the Yukon, with a B.A. (history) from the University of British Columbia (UBC), M.A. (history) from Manitoba and Ph.D. (history) from UBC, Ken has worked at universities across Canada and in New Zealand. He was the Founding Vice-President (Academic) of the University of Northern British Columbia and held administrative posts at the University of Waikato (New Zealand), the University of New Brunswick at Saint John, the University of Saskatchewan and the University of Waterloo. He was recognized by the Canadian Society for Civil Engineering for his work on the history of the Alaska Highway and is the president of the Japan Studies Association of Canada.